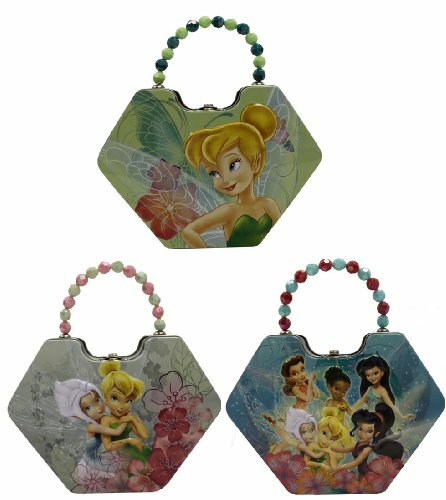 The Tin Box Company 519507-12 Disney Fairies Diamond Purse Tin is a brand new purse featuring embossed Disney's Fairies character graphics that come alive on the lid. Comes with an easy to clasp closure and hinged lid. This tin purse is great for storage of small toys and accessories. Comes with a beautiful beaded top handle. The tin measures 7-1/2 in. x 2-4/5 in. x 5-1/2 in. We at Tin Box pride ourselves on being the most innovative and reliable tin company in the industry. All of our tins are formed from high quality tinplated steel, they are printed using a 4-color process lithography and premium inks, the 3-D embossing gives the tin an expensive look at a great price! Dimensions: 7-1/2 in. x 2-4/5 in. x 5-1/2 in. If you have any questions about this product by The Tin Box Company, contact us by completing and submitting the form below. If you are looking for a specif part number, please include it with your message.